Are you looking for fun, easy, toddler-friendly activities for a preschool, story-time or fun at home with your own child? Here’s a collection of songs, crafts, and books on a spring time theme, featuring bugs, rain, and flowers. Paint with flowers. Use a carnation as a paint brush. Coffee Filter butterflies. Put out small containers of liquid watercolor, q-tips, and coffee filters. The children decorate the coffee filters. You clip them into a clothespin and add googly eyes and piper cleaner antennas if desired. 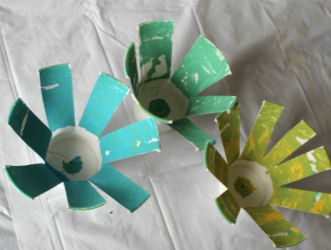 Plate or cup flowers: The children paint the inside of a paper cup, or paint a paper plate. Then you can cut it to make a flower shape. 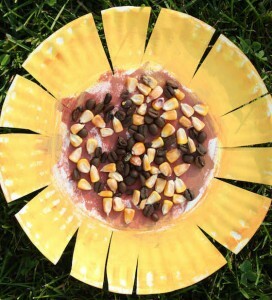 You could add seeds to the center. 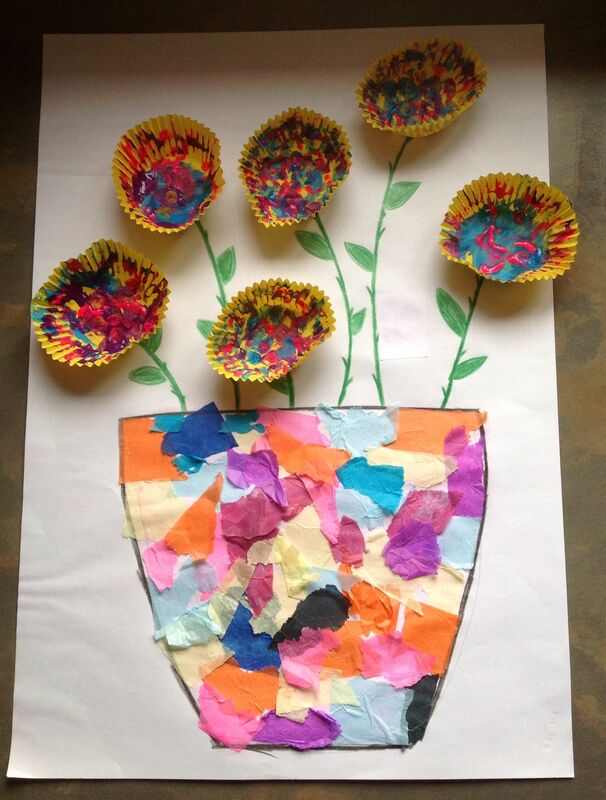 Painted flowers: Let your child paint on paper with a brush or finger paint, or dot markers, or do a spin art painting, or drip liquid watercolors on a coffee filter, or any other method of decorating paper, and then cut it into a flower shape. Cupcake paper flowers. Let kids decorate cupcake papers with any medium. Also let them decorate a big piece of paper. Then, cut a vase shape out of the paper, and assemble a collage like this. Printed Flowers. Cut the stalks off a bunch of celery and print with the base, or use a plastic bottle and print with the base. Ladybugs. You can just start with red paper circles, or you can start with a paper plate and have the child paint it red. 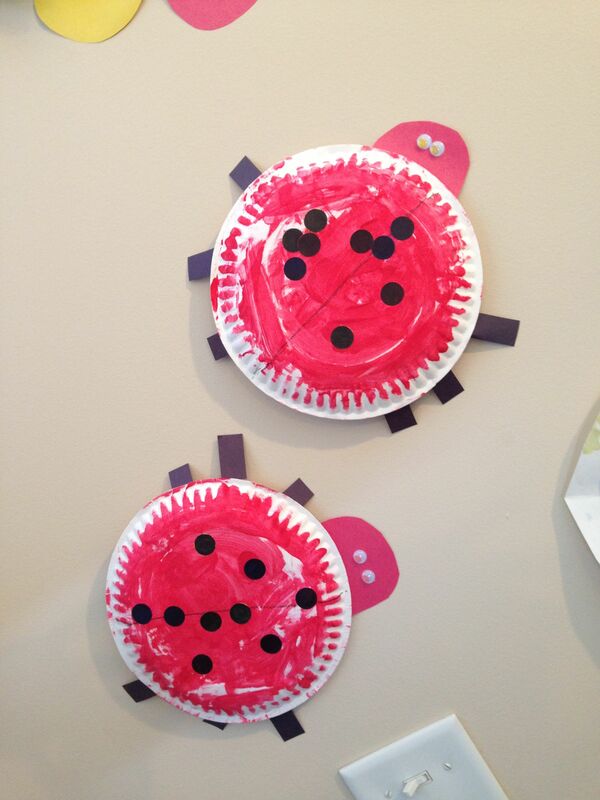 Then offer circle shaped stickers for the child to make ladybug spots with. 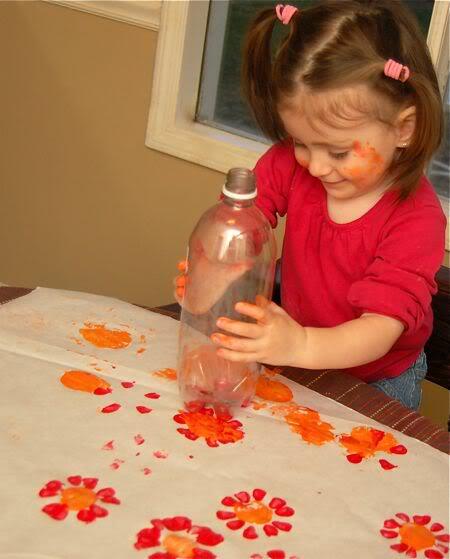 Or give them a sponge paint dauber that makes circles of paint. Sticky Butterfly. 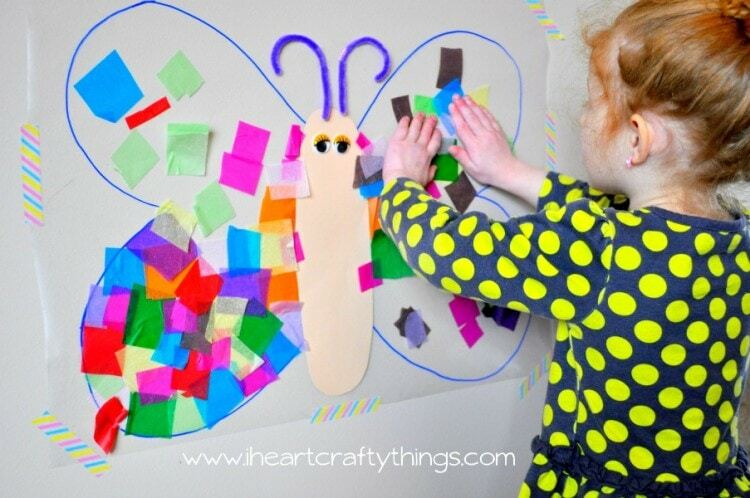 Cut a big butterfly shape out of Con-Tact paper. Tape it to wall with the sticky side facing out – peel off adhesive backing. 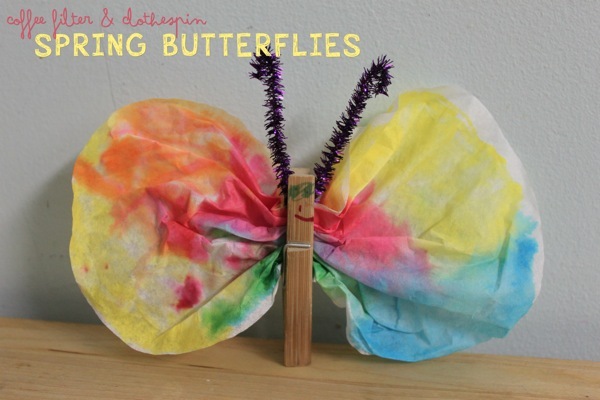 Kids stick pompoms, or squares of tissue paper, or squares of construction paper to the butterfly. Garden Sensory Bin. Fill a bin with something to represent dirt: could be potting soil, or black beans, or coconut coir fiber, or cocoa cloud dough. 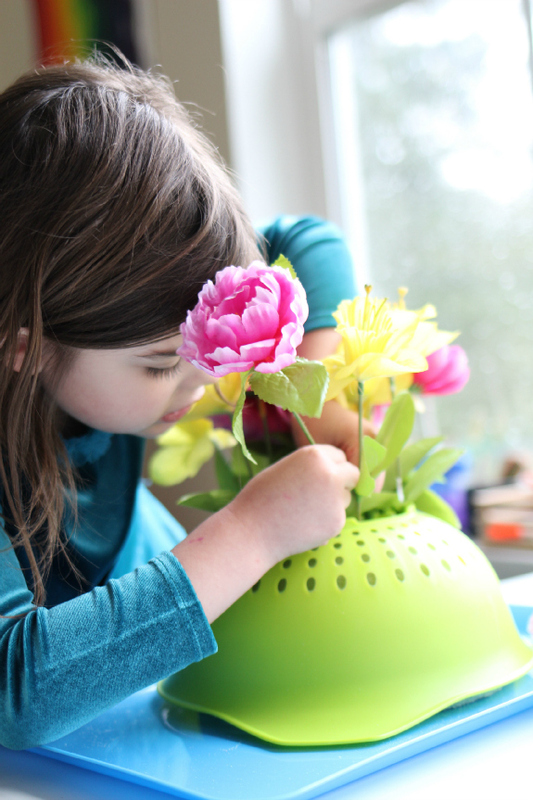 Give the child fake flowers to plant, trowels, and rakes. Bug Sensory Bin. Just take out the flowers, and add in plastic bugs! Bop the Bug. Decorate balloons to look like bugs. Give children a fly swatter to swat the bug with. Colander. Get real or fake flowers with sturdy slender stems. Child “plants” them in a colander. Play-dough garden. Put out play flowers and play-do. The child plants the flowers in the dough. Large motor skills game. 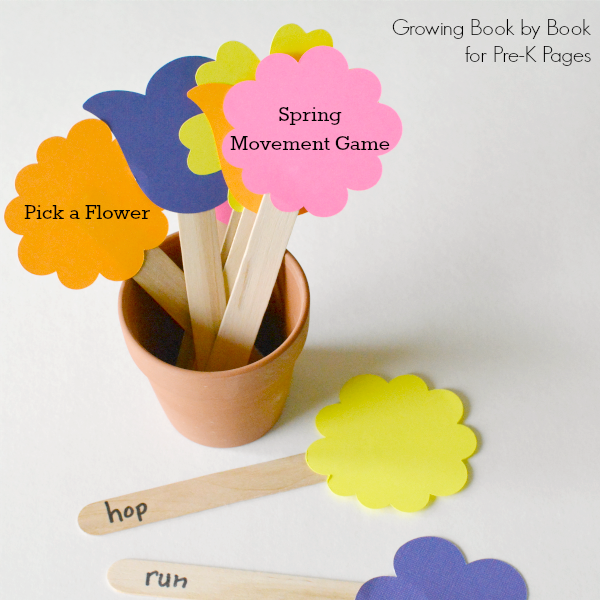 Think of a collection of spring-themed movements: “stretch tall like a sunflower”, “wriggle like a worm”, “crawl like a spider”, “spread your flower petals.” Either make a set of dice they can roll with these activities on them, or write them on cards and put the cards inside plastic eggs, or write them on paper flowers. Hopping Game. 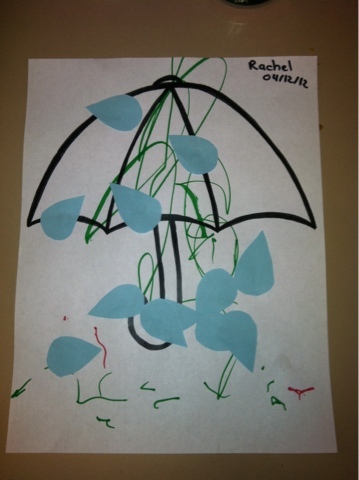 Make paper lily pads, or puddles, or flowers. Kids jump from one to the next. Inch by Inch, Row by Row. Gonna make this garden grow. All it takes is a rake and a hoe and a piece of fertile ground. Inch by Inch, Roy by Row. Someone bless these seeds I sow. Someone warm them from below till the rain comes tumbling down. Then another drop of rain hits the ground. (Tap two fingers on your palm. But, where are the bees? Hidden away, where nobody sees. A bee is on my toe. A bee is on my toe. Heigh-ho just watch me blow. The Very Hungry Caterpillar by Carle. Such a delightful story about a caterpillar transforming to a butterfly. Fun to read over and over, and easy for a child to memorize. It’s Raining, It’s Pouring Davenier. An illustrated companion to the beloved children’s song, as sung by Peter, Paul, and Mary. Welcome Spring by Ackerman, a touch-and-feel texture book. Mouse’s First Spring by Thompson. A sweet story of Mouse and Mama out for a walk, noticing the first signs of spring. Splish, Splash, Spring by Carr. A sing-songey rhyming book. Kitten’s Spring by Fernandes. Kitten meets all the new baby animals. 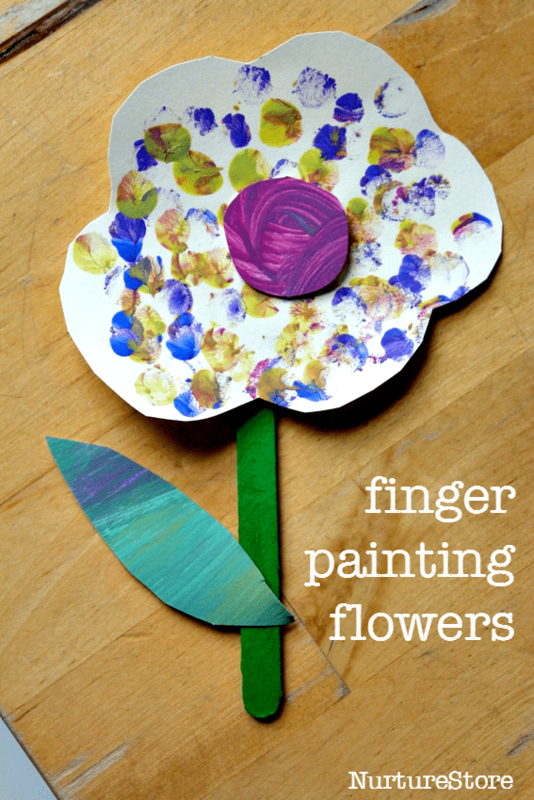 Here is a free printable handout of Spring Theme Toddler Activities you can share. This entry was posted in Fun with Toddlers series and tagged preschool, spring crafts, spring theme, storytime, toddler activities on October 5, 2018 by Janelle Durham.